Physiotherapy is arriving at a critical point in its history. Since World War I, physiotherapy has been one of the largest allied health professions and the established provider of orthodox physical rehabilitation. But ageing populations of increasingly chronically ill people, a growing scepticism towards biomedicine and the changing economy of healthcare threaten physiotherapy’s long-held status. Paradoxically, physiotherapy’s affinity for treating the ‘body-as-machine’ has resulted in an almost complete inability to identify the roots of the profession’s present problems, or define possible ways forward. Physiotherapists need to engage in critically informed theoretical discussion about the profession’s past, present and future - to explore their practice from economic, philosophical, political and sociological perspectives. 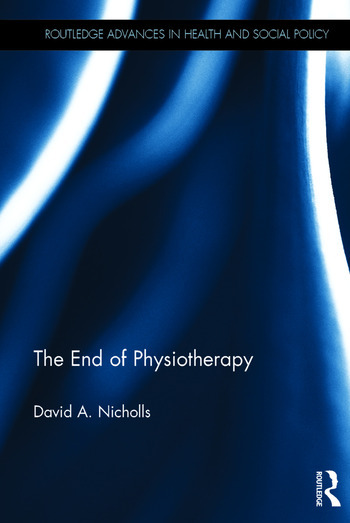 The End of Physiotherapy aims to explain how physiotherapy has arrived at this critical point in its history, and to point to a new future for the profession. The book draws on critical analyses of the historical and social conditions that have made present-day physiotherapy possible. Nicholls examines some of the key discourses that have had a positive impact on the profession in the past, but now threaten to derail it. This book makes it possible for physiotherapists to think otherwise about their profession and their day-to-day practice. It will be essential reading for scholars and students of physiotherapy, interprofessional and community rehabilitation, as well as appealing to those working in medical sociology, the medical humanities, medical history and health care policy. David A. Nicholls is Associate Professor in the School of Clinical Sciences, Auckland University of Technology, New Zealand.